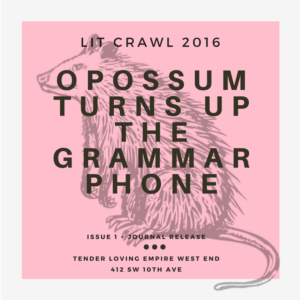 Opossum Magazine is on its way! Our beautiful (if we may say so ourselves) first issue is in the print pipeline and will be in our hands in time for our debut reading, 6 PM, November 4 at Portland’s Tender Loving Empire. The reading is part of the Lit Crawl which is happening on the eve of this year’s Wordstock festival. Get your mitts on a copy at the reading or on Wordstock’s book fair floor on November 5! You’ll also be able to order online from us soon – stay tuned!